Last week was spring break, and despite my daughter’s protests that “it didn’t sound exotic enough” (that’s a quote), I took my kids to New York City to get a taste of the Big Apple. My son, a huge fan of the TLC show Cake Boss, immediately recognized the city’s proximity to New Jersey and campaigned for a jaunt to Hoboken as part of our adventure. 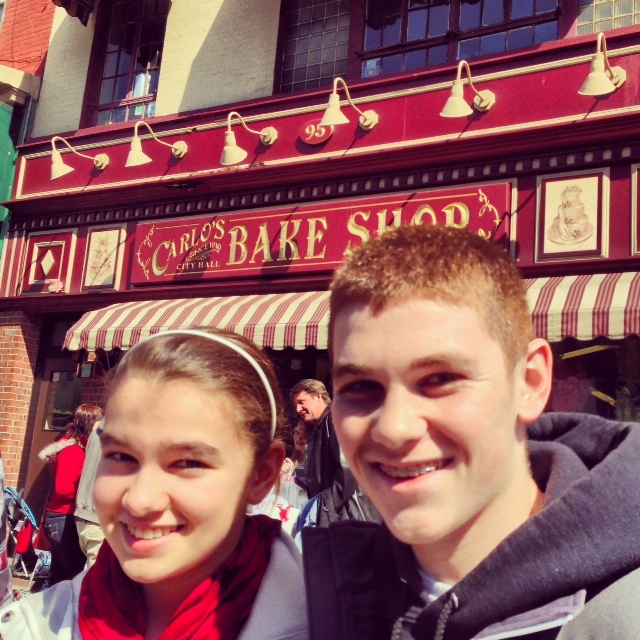 Two trains and a short walk later, we stood in front of Carlo’s Bakery, home of Buddy Valastro the Cake Boss. A few hundred other people stood in front of Carlo’s, too. Enough to make for a two-hour wait on the sidewalk. Even so, my kids enthusiastically confirmed that they indeed wanted to wait for the chance to get inside the shop; seeing it from the street wasn’t good enough. Thankfully, the weather was good and the people around us were pleasant, so we settled in to wait. Not long into our confectionery odyssey, I looked up to see a man methodically working his way down the line, group by group. When he got to us, he explained that he worked for Fran’s Italian Deli, a local establishment that offered great sandwiches on the world’s best homemade Italian bread, cold drinks, and free delivery. In fact, he said as he handed us a menu on which he had written his cell number, he would be happy to deliver to us in line. As incentive, he added a discount code to the menu. I thanked him and told him I appreciated his inventiveness, and he moved to the next group of people. Shortly after he left, I saw this man come back, this time with food. As the line progressed–the wait really was two hours long–I saw him several more times, passing out menus and delivering snacks, sandwiches, and cold drinks to my fellow Carlo’s groupies. Here was a guy who didn’t bemoan a long line of people waiting to go to somewhere else. He didn’t begrudge the success of a fellow businessman and grumble, Why can’t this be me? Instead, he saw an opportunity, and he capitalized on it. He got creative, and instead of bringing people to his business, he brought his business to them. He assessed their needs and figured out how to address them in a way that meant success for everyone. It gave the people in line something to do, satisfied hungry bellies and thirsty mouths without forcing people to lose their places in line, and it gave the cash coffers of Fran’s Italian Deli an upward bump. Now contrast this scene with a couple of the other storefronts along the same sidewalk. Employees from those businesses periodically came outside to shoo us waiters away from their doors to accommodate customers who might want to come in. Instead of seeing a potential audience, they saw a definite nuisance. What a missed opportunity. As the guy from Fran’s realized, opportunities abound. Go out and get them. This, young lady, is an excellent blog post, and a great point! Ah, Mausi, I’ve missed you! Thanks for the kudos. Your opinion means a lot to me! Another outstanding post, Tammy! Making lemonade out of lemons; Fran recognized a positive while most saw the negative. A reminder to me to ask “what can I do that is positive when faced with what I likely first consider a negative”. Thank you. Thanks, Paul! You just summed it up way more succinctly than I did! How often we look at things as problems instead of opportunities. Great illustration to this. What a smart guy & I love that your son is a fan of the show. Excellent point! We should all learn a thing or two from this! I love this!! What a fabulous perspective. How was it once you finally got inside the shop? Do the cakes look just as delicious in person? Love it when you comment, Amber. Everything looked delicious! We bought way too many sweets and then took them to a park and ate every last one. The pastries were out of this world; whatever is in his cream filling recipe was worth the wait! Oh man, you had me at “cream filling”. A friend came over for a visit last night and we watched the food network the ENTIRE TIME. I love seeing desserts get made! So glad it was worth the wait to see it in person!